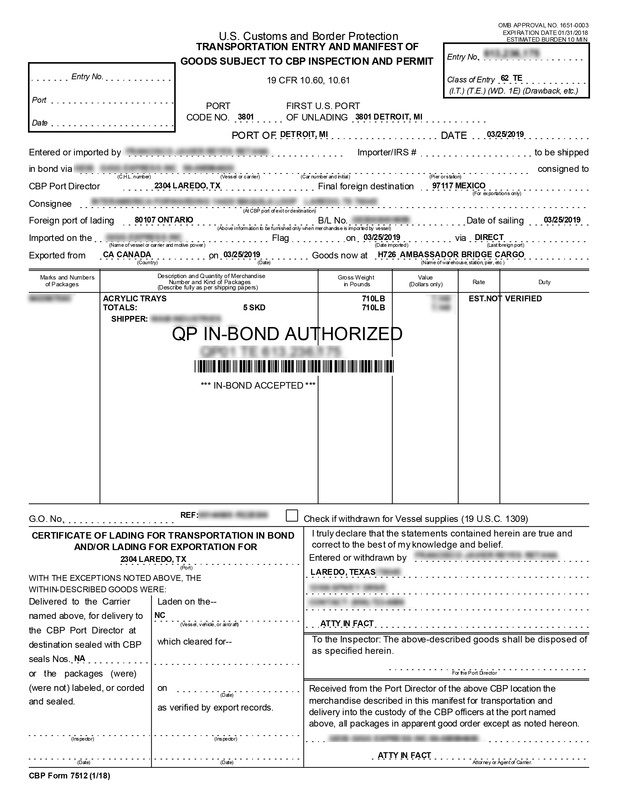 If you plan to transport goods through the United States you will surely hear the term “bond” or “customs bond”. In this post, we explain what is the bond and what in-bond shipments are. 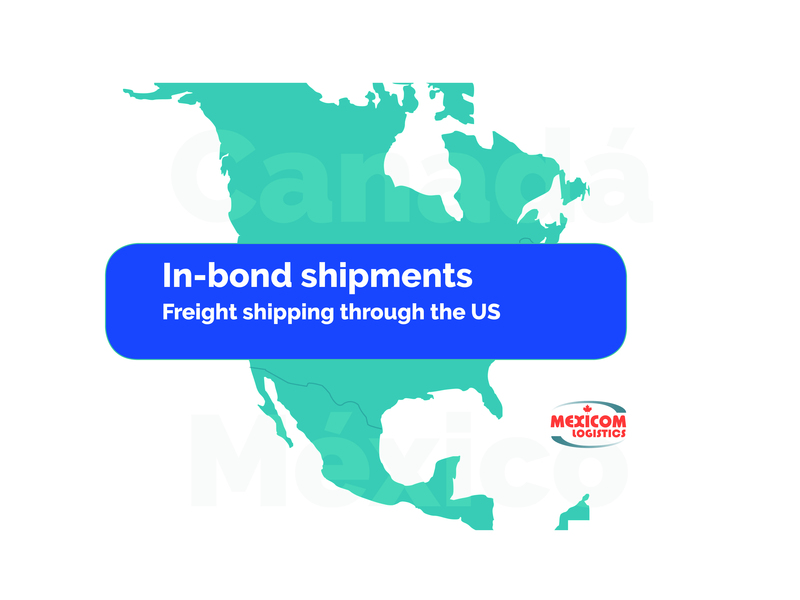 In addition, we will explain to you who is responsible for opening and canceling the bond when shipping cargo from Canada to Mexico, and from Mexico to Canada. If you have any questions about freight transportation process between Mexico and Canada, do not hesitate to contact us. In simple terms, in-bond loads are those that are stored or transported through the United States but are not intended to be commercialized in that country, so they do not clear customs in the US border. 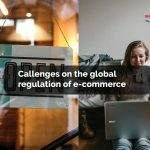 In other words, the in-bonded shipment may be transported and stored in the United States without having to pay duties, taxes or customs costs related to the import process. The in-bond cargo must be transported by a bonded carrier and, if applicable, be stored in a bonded warehouse in the United States. If the shipment requires to be transported through two points within the United States in order to be exported to a different country, a Transportation and Exportation Bond or T & E is required. When the shipment is transported between two points of entry within the customs territory of the United States to enter the destination port, an Immediate Transportation Bond (IT) is required. Example 1. An LTL shipment that leaves Mexico and that is transported by land through the United States to be exported to Canada. Example 2. An FTL shipment that is transported by land in a reefer from Laredo to an international airport within the United States, such as Houston, to be transported by plane to Europe. Example 3. A Dry Van that leaves Laredo and is transported by land to a seaport in Miami, to be sent by sea to Europe. What is the customs bond? The customs bond is a form of insurance to protect the United States in the event that an importer or exporter does not pay the duties, taxes or fines incurred in their imports. A bonded carrier is a carrier authorized by customs, through the bond, to transport goods that have not paid taxes, duties or any other cost related to the import process. It is a place approved by US Customs to store merchandise until the customs duties have been paid or until the cargo is cleared according to the law. 1- The American Customs Agent opens the bond or customs bond. 2- With the bond open, the in-bond shipment is transported through the territory of the United States by a bonded carrier. 3- During transit, the carrier generates a PARS (Pre-arrival Review System). 4 – The Canadian Customs Agent releases the PARS so that the carrier can pass through the Canadian border without problems. 1-The carrier’s Customs Agent opens the bond. 2- With the bond open, the in-bond shipment is transported through the United States. 3-The carrier arrives the bond. 4-The American Customs Agent is in charge of closing the bond. When the manifest is generated to import the shipment to Mexico, the bond is considered canceled. We are experts in the creation of T&E, IT, and all the necessary documents to make your BONDED shipments as if they were local movements. We have helped hundreds of clients and customs brokers to understand the Canadian processes for imports and exports.